Isela Meraz and Fernando Lopez lead a group of undocumented Hispanics in protest against anti-immigration laws during a briefing on the civil rights effects of state immigration law held by the U.S. Commission on Civil Rights in Birmingham, Ala.
BIRMINGHAM, Ala. -- Protesters opposed to strict state-level immigration laws confronted one of the key writers of such legislation as he testified at a U.S. Department of Justice civil rights hearing here on Friday. Holding up small banners with the words "undocumented" on them, four self-proclaimed undocumented immigrants stood up one at a time to denounce the laws, interrupting the testimony being given by Kansas Secretary of State Kris Kobach, who helped author the measures in Alabama and Arizona. Kobach, who advised those states before being elected to statewide office in Kansas, and others were invited to speak about the impact of such laws by the U.S. Commission on Civil Rights, an independent commission of the federal government. 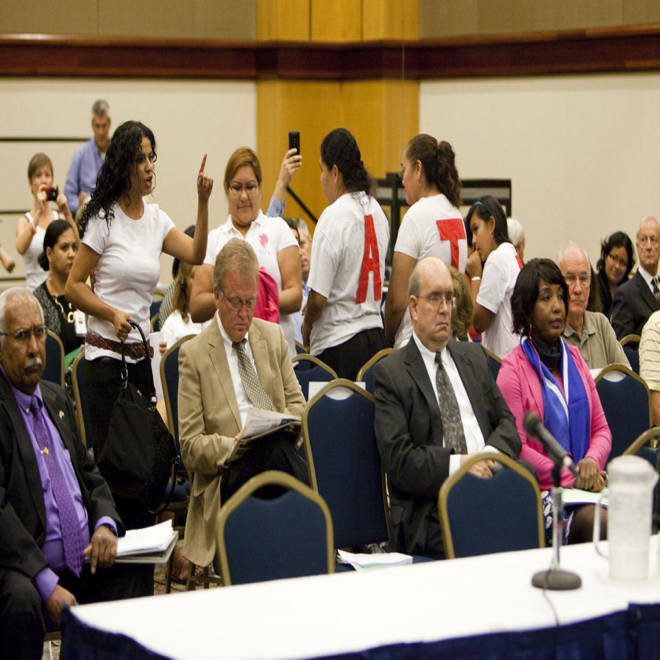 But the session was interrupted by protests. "I have received a lot of discrimination. I am Maria Huerta, undocumented and without fear. I have no fear! You have to respect our rights. They are civil rights," the 65-year-old woman, originally from Mexico, cried out just before throwing the hearing agenda on the floor. "I leave it there. Keep it. You don't know how to respect human suffering." Huerta is among a group of undocumented immigrants traveling across the country in a caravan to highlight their situation and those of others still living in the shadows. Before landing in Alabama, the ragtag caravan made stops in Colorado, New Mexico, Texas, Louisiana, Mississippi and Tennessee. Their ultimate goal is the Democratic National Convention in Charlotte, N.C., where they intend to press their concerns. Moments before Huerta spoke, another group of five women stood up and turned their backs on the commission as Kobach began his testimony. They wore shirts that spelled out "stop hate." 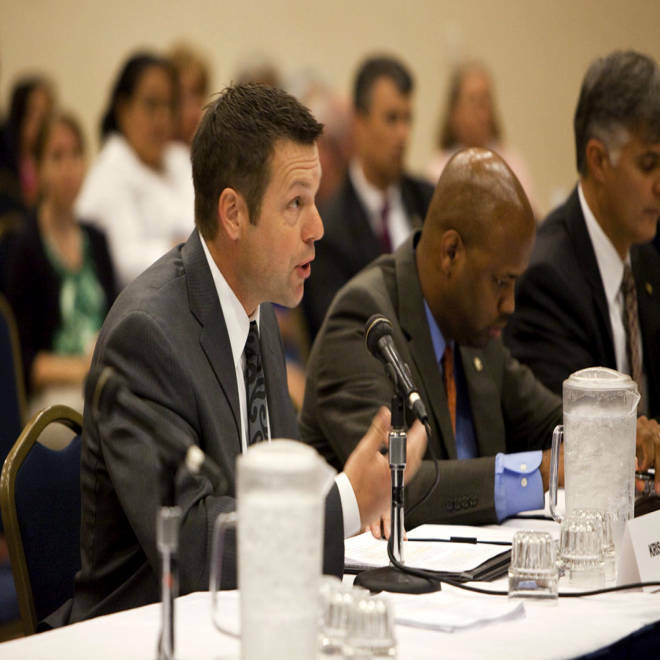 Secretary of State Kris Kobach of Kansas addresses the commission during a briefing on civil rights effects of state immigration laws held by the U.S. Commission on Civil Rights in Birmingham, Alabama on August 17, 2012. Emotions ran high later when protesters called Kobach, a "liar," with Mayra Rangle, 32, telling commissioners: "It's a shame you invited him and him," as she pointed to those invited to speak. 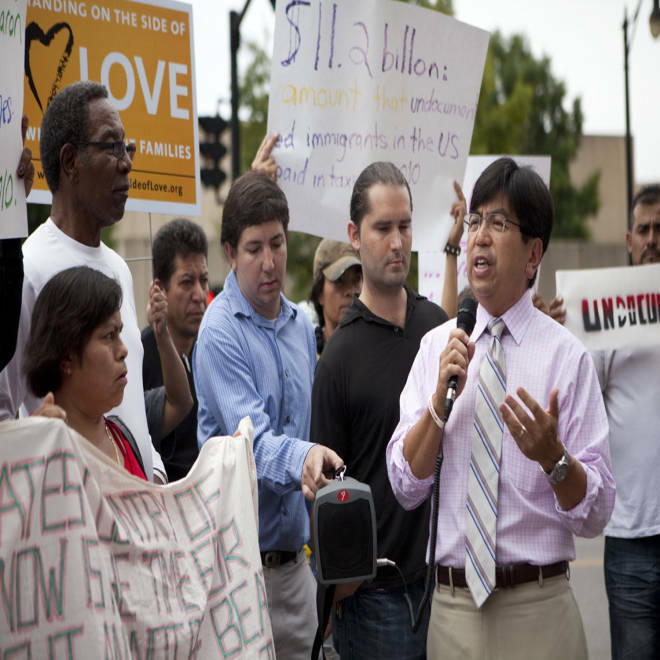 Dreamers can apply for deferred action - now what? After the hearing, Kobach said the protesters had the right to voice their opinions, but the interruptions were disrespectful. "It's inherently rude and it disrespects the American process of deliberation and careful policy making," he said. "It's really unfortunate when one side in a debate results to personal insults instead of bringing information and making a coherent point." When asked why he didn't respond to them when challenged, he said: "I was there to respond to the panel not the protesters." During the protest, the civil rights commissioners argued about the presence of the demonstrators, with Commissioner Todd Gaziano, a Heritage Foundation fellow, denouncing the lack of security and Commissioner Michael Yaki, of Michael Yaki Consulting, noting the demonstrators were acting in the form of non-violent protest. Civil Rights commissioner Michael Yaki addresses a crowd of mostly undocumented immigrants in downtown Birmingham, Ala.
Gerardo Torres, 41, a Mexican who lives in Phoenix, said after the hearing that those who wrote the immigration laws were out of touch. "I don't think they have ever been in contact with regular people," he said. "At the end of the day, I think they just go back to their gated community. ... They are not in touch with reality." Mayra Rangel, 32, from Blout County, Alabama, protests during a briefing on the effects of state immigration laws.